The house crow (Corvus splendens) has established itself in at least 25 countries. It proliferates in human settlements and disturbed habitats and is especially suited to coastal settlements. It can even penetrate harsh desert environments once man has become established there. The house crow causes problems across a range of areas, including crop and livestock sustainability and poses a risk to native avifauna. It also carries a range of human pathogens but a link with human disease is yet to be established. The house crow is a slender bird with a long neck and relatively large bill. The head-body length is 40cm and it weighs approximately 245 to 370 grams. The house crow is glossy black except for a well defined smoky-grey \"collar\", from hindcrown to mantle and breast, the shade of which varies among the five subspecies. Sexes are alike, with males being slightly larger (Rasmussen and Anderton 2005). The five subspecies of Corvus splendens are: C. splendens splendens, C. splendens zugmayeri, C. splendens protegatus, C. splendens maledivicus a nd C. splendens insolens (Avibase 2003). In their native range they (Corvus splendens) are kept in check by other Corvids as competitors, as well as birds of prey, snakes and monkeys as predators. The birds are effective defenders of their nests against feral animals (cats) and also native predators. In its introduced range, no direct persecution by predatory species has been observed. House crows are highly social, staying in a locality for perhaps their whole life. Movement into new areas is often as a result of major disturbances (e.g. attempted unorganised control) on nest or roost sites, however, adult birds regulary travel up to 20 km per day to known feeding areas. In the late 1800s, the house crow was introduced to some locations for the purpose of garbage elimination and clean up services or to control agricultural pests. It was also thought to control rodent pests around houses. This species presents great ecological flexibility, as well as an obligate association with human presence, to the extent that no populations are known to live independently of man (Nyari Ryall and Peterson 2006). As such it is associated with human settlements, disturbed areas, and especially coastal settlements (Rasmussen and Anderton 2005). 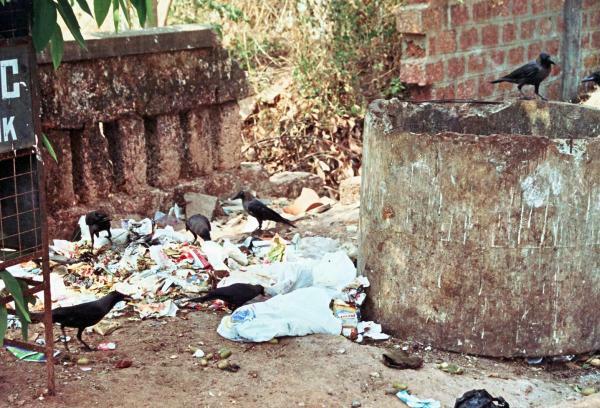 Invaded areas are mainly urban or semiurban, where house crows benefit from improper human food and refuse handling: commercial areas, public housing areas and urban parks are associated with higher abundance (Lim et al. 2003); clearly, this human association broadens the ecological potential of the species into areas that might not otherwise be habitable (Nyari Ryall and Peterson 2006). The house crow has successfully invaded tropical and subtropical regions well beyond its native range, reaching pest proportions in many areas (Brook et al. 2003). The small Hoek van Holland population and establishment of a satellite colony of house crows at den Haag in the Netherlands are the first cases of the species breeding in a temperate climatic region, showing its ability to survive winters with temperatures as low as -8°C and its ecological plasticity (Nyari Ryall and Peterson 2006). It is reported at altitudes of up to 2100 metres in its native range (Rasmussen and Anderton 2005). Finally, these distributional potential of the house crow may be in the process of shifting, given the current global climate shift, which could broaden the species’ distributional potential at the poleward limits (Nyari Ryall and Peterson 2006). In its native range house crow nesting is mainly between April to June, (reports from India are April - August). In its introduced range in East Africa (Kenya, Tanzania) breeding occurs mainly between September - January. Nests are located 4m or higher up in trees and dense foliage is preferred. Communal nesting sites are not usual but it appears the house crow is adaptable (depending on locations and conditions). Clutch size: 4 - 5 eggs pale blue-green, speckled and streaked with brown. Both sexes share incubation and nest feeding. Two clutches per year are reported to be possible. In thier native range house crows are under severe pressure by the Indian koel (Eudynamys scolopacea), a brood parasite specialised in parasitising house crow nests. The house crow is an omnivore, feeding on fruits, birds, mammals, reptiles and garbage. This scavanging bird can be found in cities feeding on human food remains and drinking freshwater from swimming pools and artificial ponds. 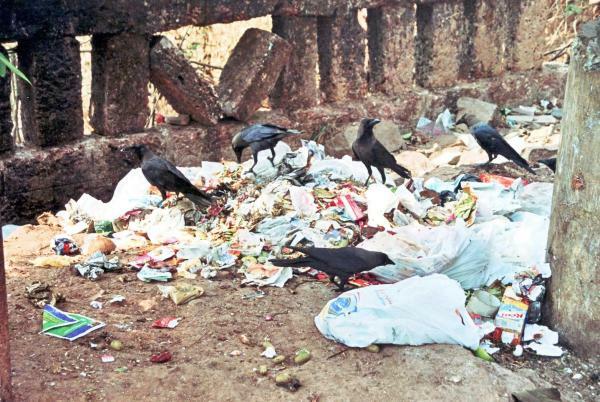 In fact house crows are closely tied to human habitation and refuse seems to form an important part of their diet (Ali and Ripley 1972, Goodwin 1976, Feare and Mungroo 1989, in Feare and Mungroo 1990). The spread of the house crow has resulted from both inadvertent introductions associated with increased global sea traffic and trade and deliberate introductions (Long 1981, in Brook et al. 2003). For example the house crow was transported to Israel via ships going along the Red Sea and to the Gulf of Eilat (it is not clear whether these translocations were intentional) (Roll Dayan and Simberloff 2007).From its natural range, the house crow has been deliberately introduced to new areas as an aid to cleaning refuse from towns (Long 1981, Ryall and Reid 1987, in Feare and Mungroo 1990). Review: Dr. Colin Ryall, Senior Lecturer, Kingston University, London. Recommended citation: Global Invasive Species Database (2019) Species profile: Corvus splendens. Downloaded from http://www.iucngisd.org/gisd/species.php?sc=1199 on 22-04-2019. Introduced populations of house crows often present major problems to humans and native wildlife (Feare and Mungroo 1990). In addition to the ecological damage, the house crow also inflicted economic damage by predating chicks and eggs (making free-ranging poultry impossible) and eating crops such as maize (Zea mays) and sorghum (Sorghum vulgare) (Archer 2001, in Lim et al. 2003). The house crow is a nuisance to people and presents a real threat to the tourist amenities and industry in some regions. C. splendens is an intestinal carrier of at least eight human enteric diseases (Ash 1984a, in Ryall 1992). 15 % of crows carried serotypes of Salmonella, 8 % Plesiomonas, 4 % enteropathic Escherichia coli, 3 % Shigella and 3 % Aeromonas hydrophila. Please see detailed impacts for more details on the impacts of the house crow. The transfer of house crows into new countries is mainly ship-assisted. Their proliferation in East Africa may have been supported by some religious groups which consider the crow to be sacred. The house crow is likely to be highly resilient to human attempts at eradication due to its intelligence (eg: propensity to switch roosts when threatened), competitive ability, opportunistic feeding habits, and high innate reproductive capacity. A multifaceted approach involving substantial culling effort, coupled with a strategy of deliberate nest destruction and limiting food supply and suitable nesting sites is most likely to bring success (Soh et al. 2002, in Brook et al. 2003). In several parts of their range house crows have reached pest status and attempts have been made to reduce their numbers. In Malaysia trapping and shooting are the main strategies employed (P. Green in litt., in Ryall 1992), in Aden, Yemen, and the Maldives various poisons have been used (Monocrotophos 60, alpa-chloralose, Fenthion and Starlicide, Ash 1984a b, in Ryall 1992), while in Mombasa, Kenya, a combined system of trapping, poisoning and destruction of eggs and chicks is meeting with some success (Ryall and Reid 1986, in Ryall 1992). According to Pakenham (1979, in Ryall 1992), attempts at control over many decades, including a bounty system, have failed in Zanzibar and C. splendens is still numerous there. However, in Australia payment of rewards for reports of birds, followed by shooting, has successfully prevented the establishment of crows arriving on Indian cargo vessels (Frith 1976, in Ryall 1992). Ryall (1992) states that this species proliferates mainly where a lack of resources or organisation results in the accumulation of human refuse, which provides a plentiful food supply. Control of this problem undoubtedly has the greatest control effect on house crow numbers. Preventative measures: Avoidance of transport of birds by ship to ports and cities outside its current area. Establishment of regular control inspections at vulnerable points of entrance and relevant locations in cities and developments would be useful, as would be networking with neighbouring communities and countries to monitor regional trends and patterns. Other measures include keeping city environments clean (especially garbage eliminiation) and modification of micro habitat (e.g. by selection of species of tree used for planting). Chemical: Poisoning of birds with various avicides has given good results when pre-baiting was undertaken and in conjunction with sanitary improvments. Howevern, uncontrolled poisoning operations may effect non-target wildlife, the environment and human resources (e.g. water). The detetction and elimination of any survivors (often widely dispersed) is labour intensive and costly but crucial to achieve long lasting results. Informations on Corvus splendens has been recorded for the following locations. Click on the name for additional informations. Archer, A.L., 1995. 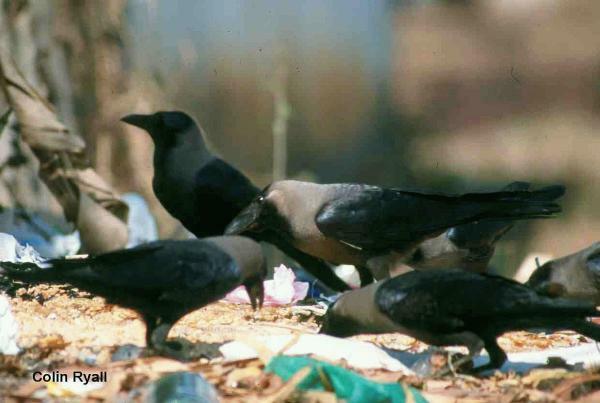 The Indian House Crow Corvus splendens control programme in Zanzibar and Pemba Review for the five years 1990-1995. Unpublished report. Archer, A.L., 1998. 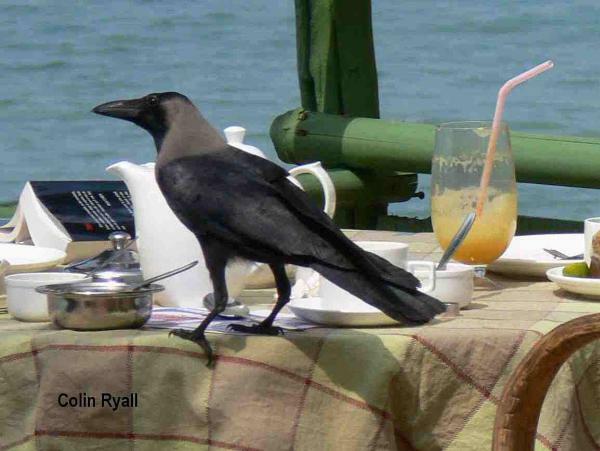 Indian house crow (Corvus splendens): a control programme and recommendations for Republic de Djibouti. A consultant report to National Biodiversity Strategy Action Plan Project (NBSAP), Ministre de l'Environment du Tourisme et de l'Artisanat (META) and World Conservation Union (IUCN) Regional Office for Eastern Africa. Brooke, R.K., Lloyd, P.H. & de Villiers, A.L. 1986. Alien and translocated terrestrial vertebrates in South Africa. pp. 63 - 74 in: Macdonald, I.A. et al. (eds.). The ecology and management of Biological Invasions in South Africa. Oxford University Press, Cape Town, South Africa. Charles, J. K. 1978. Management of the House Crow - an urban problem. Biotropica Special Publication 8: 191 - 197. Feare, C.J. and Mungroo, Y. 1990. The Status and Management of the House Crow Corvus splendens (Vieiilot) in Mauritius, Biological Conservation 51: 63-70. Summary: An assessment of the potential impacts of the house crow in Mauritius and a description of recommended management practices. Gibbs, D.; Wolfaardt, A.; Shaw, K. Unpublished Evaluation of the 2003 House Crow eradication programme. Hails C. J. 1985a. Studies of problem bird species in Singapore. II. Corvidae (Crows). Unpublished report to Commissioner for Parks and Recreation, Ministry of National Development, Republic of Singapore. Hails, C. J. 1985b. Bird pests, management techniques and the status of bird pests in Singapore. Journal of the Singapore National Academy of Science 14: 15 -23. Howard, G.W. 2003. Control of the invasive Indian House Crow on the Eastern Africa coast and its hinterland. A project concept note. Environment Initiative of NEPAD & IUCN Eastern Africa. Lens, l. 1996. Hitting back at House Crows. Kenya Birds 4: 55 - 56. Peh, K. S. H. & N. S. Sodhi. 2002. 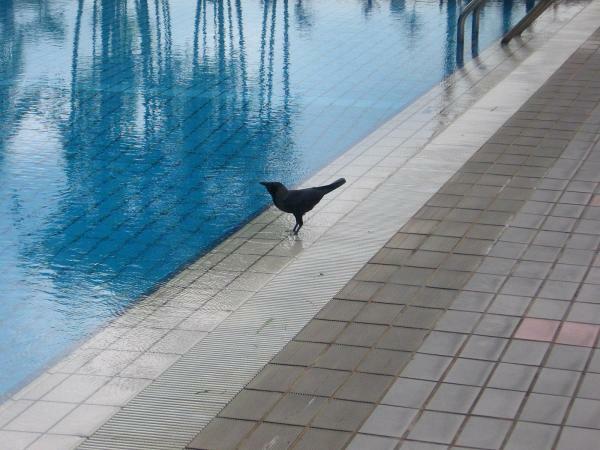 Characteristics of nocturnal roosts of house crows in Singapore. Journal of Wildlife Management. 66 (4): 1128 - 1133. Puttoo, M. and Archer, T. 2003. Control and/or eradication of Indian crows (Corvus splendens) in Mauritius, AMAS. Food and Agricultural Research Council: Réduit, Mauritius. Summary: Resource for information on the status and control of the house crow in Mauritius. Rhoda, L. Unpublished Operational Manual for the Eradication of House Crows April 2003. Roy, P. 1998. Isolation of Newcastle Disease Virus from an Indian House Crow. Tropical Animal Health and Production. Vol. 30 (3): 177-178. Ryall, C. 1990. Notes on nest construction by the Indian House Crow Corvus splendens and other aspects of its breeding biology in Mombasa, Kenya. Scopus 14 (1): 14-16. Ryall, C. 1992. The pest status of the Indian House Crow Corvus splendens in Mombasa and a survey of its expansion of range in coastal Kenya; In: L. Bennun (Ed). Proc. VIIth Pan. African Ornith. Congr. Nairobi, Aug 1988. Ryall, C. 2003. Mimicry of a crow chick by an Asian koel Eudynamys scolopacea as a defence against attack by house crows Corvus splendens. J. Bombay Nat. History Soc. 100 (1):136-138. Ryall, C. 2003. Notes on ecology and behaviour of House Crows at Hoek van Holland. Dutch Birding 25 (5): 167 - 172. Summary: This web site is part of a 25 year old programme to monitoring the continuing world-wide invasion of the House Crow, as well as its status in places where it has already established. Sodhi, N. S. & Sharp I. 2006. Winged Invaders. Pest birds of the Asia Pacific. SNP Publishing, Singapore. Soh, M.C.K., N.S. Sodhi., R.K.H. Seoh and B.W. Brook., 2002. Nest site selection of an urban invasive bird species in Singapore, the House Crow (Corvus splendens), and implications for its management. Landscape and Urban Planning 59: 217-226. Ali, R. 2003. Invasive species and their likely effects on the avifauna of the Andaman islands: research opportunities. Newsletter for Birdwatchers 09/03. pp. 1- 4. FERAL, Pondicherry, India. Ali, R. 2003. Issues relating to invasives in the Andaman Islands. Proceedings of Bombay Natural History Journal Centenary Seminar 13-15. November 2003, Mumbai, India. 18 p.
Allan, David & Davies Greg., 2005. Breeding biology of House Crows in Durban, South Africa, Ostrich - Journal of African Ornithology Vol. 76, No. 1 -2, pp. 21-31. Allan, D. & Davies, G. 2001. The problem House Crow of Durban, South Africa. Ostrich Supplement 15: 253. Ash, J.S. 1984. UNEP report to the government of the republic Yemen on "combating the crow menace" 28p. Ash, J.S. 1984. Vertebrate pest management (bat and crow control), report prepared for the government of the Maldives. FAO, Rome. 11 p.
Ash, J.S. 1985. Two additions to the Somalia list, Greater Frigatebird and Indian House Crow. Scopus 9: 108 - 110. Avibase (The world bird databse). 2003. House Crow (Corvus splendens) Vieillot, 1817. Summary: List of common names and subspecies of C. splendens. Azeria, E.T. 2004. Terrestrial bird community patterns on the coralline islands of the Dahlak Archipelago, Red Sea, Eritrea. Global Ecology and Biogeography, Global Ecol. Biogeogr. 13: 177-187. Summary: Includes a record of the house crow in Eritrea (Massawa). Bergiera, P., Franchimont, J., Thévenotc, M. and the Moroccan Rare Birds Committee. 2005. Rare birds in Morocco: report of the Moroccan Rare Birds Committee (2001-2003), Bull ABC 12(2). Summary: Includes the first recorded sighting of the house crow in the Moroccan port of Tangier. Berruti, A. 1997. House Crow. p. 108 in: Harrison, J.A. et al. (eds.). The Atlas of Southern African Birds,. BirdLife South Africa, Johannesburg. BirdLife International. 2004. Corvus splendens. In: IUCN 2007. 2007 IUCN Red List of Threatened Species. .
Summary: Distribution records for the Indian house crow. Chia P. K. 1976. Some aspects of the natural history of the House Crow in Kuala Lumpur. Unpublished BSc thesis, University of Malaysia, Kuala Lumpur. Clarke, G. 1967. Bird notes from Aden Colony. Ibis 109: 516 - 520.
Cooper J. C. 1996. Health studies on the Indian House Crow. Avian Pathology 25: 381 - 386. Dhindsa M S, Sandhu P S, Saini H K and Toor H S 1991. House Crow damage to sprouting sun flower. Tropical Pest Management 37: 179-181. Summary: Record of C. spledens in the proposed Rum Wildlife Reserve, South Jordon. Goodwin, D. 1986. Crows of the world. 2nd edition. British Museum of Natural History. St. Edmundsbury Press Ltd.
Summary: Email regarding the status of the house crow in Tanzania. Jeyarajasingam A. & Pearson, A. 1999. A field guide to the birds of West-Malaysia & Singapore. Oxford University Press. Jones, C. 1996. Bird introductions to Mauritius, status and relationships with native birds. Pp. 113 - 123 in: Holmes J.S. & Simons, J.R. (eds.). The introduction and naturalisation of birds. The Stationery Office, Norwich. Kinnear, N.B. 1942. The introduction of the Indian house crow into Port Sudan. Bulletin of the British Ornithologists' Club 62: 55 - 56. Leven, M.R. and Corlett, R.T. 2004. Invasive birds in Hong Kong, China, Ornithol Sci 3: 43 - 55. Summary: A history of the house crow in Hong Kong and a mention of future population trends. Lever, C. 2006. Naturalised birds of the world. T & AD Poyser Publisher. 352 pp. Madge, S. & Burn, H. 1999. Crows and Jays - a guide to crows, jays and magpies of the world. C. Helm Publisher. 216 pp. Matthews, S. & Brand, K. 2004. Africa invaded - the growing danger of invasive alien species. GISP. Oatley, T.B. 1973. Indian house crow - first South Africa sightings. Bokmakierie 25:41-42. Ottens, G & C Ryall 2003. House Crows in the Netherlands and Europe. Dutch Birding 25(5): 312-319. Summary: A distribution record for this species in Israel. Ryall, C. 1986. Killer crows stalk the Seychelles. New Scientist, 2 Oct 1986: 48 - 49. Ryall, C. 1994. Recent extensions of range in the house crow Corvus splendens, Bull. B.O.C. 114(2): 90 -100. Summary: An extensive description of the global ntroduced ranges of the house crow. Ryall, C. 2002. Further records of range extension in the House Crow Corvus splendens, Bull. B.O.C. 2002 122 (3): 231 - 240. Summary: An updated extensive description of the global ntroduced ranges of the house crow. Ryall, C. & C. Reid 1987. The Indian House Crow in Mombasa. Bokmakierie 39 (4): 113 - 116. Ryall, C. & C. Reid 1987. The Indian House Crow in Mombasa. Swara 10 (1): 9 - 12. Ryall, C. (in press). House Crow Corvus splendens. In: Jennings M C. Atlas of the Breeding Birds of Arabia. Shepherd, C. 2000. House Crow observed in north Sumatra. Kukila 10: 162-163. Sinclair, J.C. 1974. Arrival of the house crow in Natal. Ostrich 45:189. Sinclair, J.C. 1980. House crow in Cape Town. Promerops 144:7-8. Yap, C.A.M. and Sodhi, N.S. 2004. Southeast Asian invasive birds: ecology, impact and management, Ornithol Sci 3: 57-67. Summary: Records of the potential and actual impacts of the house crow in South East Asia. Zann, R.A. 1992. The Birds of Anak Krakatau: The Assembly of an Avian Community, GeoJournal 28(2): 261-270. Summary: Record regarding the status of house crows on the island. InGrip-Consulting & Animal Control are a small but specialised company from Germany involved in invasive species management especially eradication. Long term scientific and management interest on the species (more then two decades until now); author of main publications on worldwide spread.